Mince the meat in a meat-grinder and combine well with onions, water, salt and spice must be lately fried. 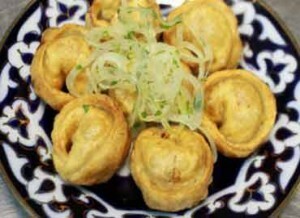 Make stiff dough out of flour, salt, egg, and water like for chuchvara recipe above. Roll out dough into 1-2 mm thick layer and cut into 5x5 cm squares. Place a teaspoon of filling in the center, fold dough corner to corner, pinch edges completely enclosing meat. Fry in hot oil.